In-House Master Tailoring Our tailors will carefully take your measurements ensuring that the fit, model and look is just right for you. 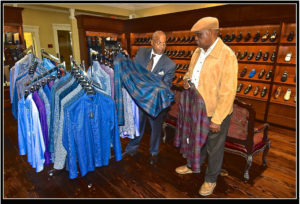 Custom Clothing Select from fabrics and models from the finest luxury brands such as Brioni, Canali, Hickey, and Freeman. Measurements are meticulously taken to fit your precise size and style. Inventory Select from a vast assortment of the finest clothing, sportswear, shoes, and accessories from American manufactures, as well as the most exclusive brands from around the world. Knowledgeable Staff Our personal consultants will work with you to choose the wardrobe selection to fit your needs and personal style. We can help you choose the right pieces for your event or any occasion. Gift Cards Always the right fit, size and color for that special someone.